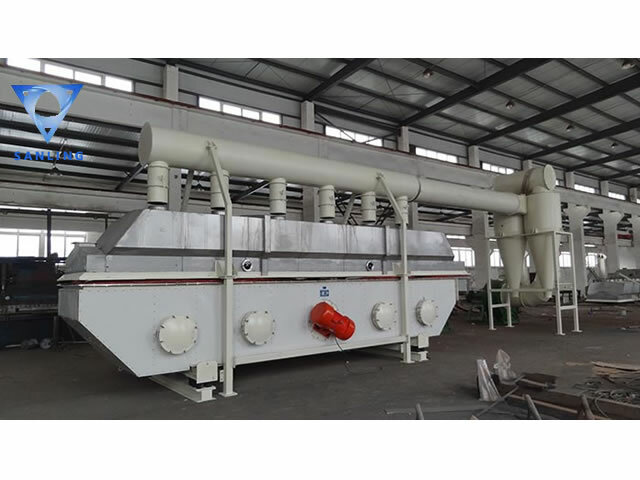 The vibrating fluidized bed dryer adopts the structure of two-body resonant. The inertial exciter and the resonant mass form a resonance unit, ordinary motor drives the gear excitatory through the universal joint. The exciting force is amplified by resonance spring Several times on the working body, the material in a fluidized state and jump forward by exciting force, while the Hot air through layer at the bottom of the vibrating fluidized bed, the material particles and hot air are fully Contact to achieve the desired drying effect. High Mechanical, thermal efficiency and energy-saving, It can 30 to 60% energy than other drying device. Waste treatment and environmental protection industry: alcohol bad, antibiotic residue, garbage and so on.